When: March 9-July 14, 2019, open everyday 10am-8pm, Thursdays until 11pm. Post updated 2019-03-08 to add photos from the exhibition that I particularly loved ;-). 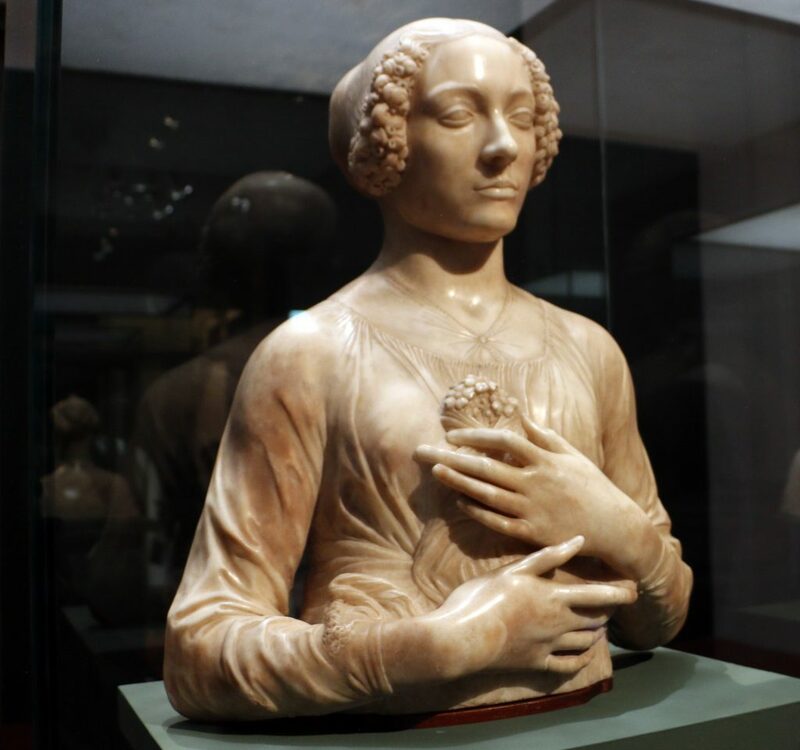 Have you heard that Andrea del Verrocchio is coming back to Florence? In just a few days, the much-awaited exhibition will be opening at Palazzo Strozzi and will include not only masterpieces by this Renaissance artist but also important works of artists from the same period, the second half of the 1400s, tied to his workshop. These include Domenico del Ghirlandaio, Desiderio da Settignano, Sandro Botticelli, Pietro Perugino, and, of course, Leonardo da Vinci, his most famous student. In 2019, the world is celebrating 500th anniversary of the death of Leonardo so the exhibition falls into one of the most important during the celebrations. The two experts of art from the 15th century and curators of the exhibition, Francesco Caglioti and Andrea de Marchi, have brought together over 120 extraordinary works of art, including paintings, sculpture and designs, to create the first retrospective ever dedicated to Andrea del Verrocchio while also illustrating the start of Leonardo da Vinci’s artistic career with 6 of his works. The exhibition will allow us to see the great artistic creations in Florence during the times of Lorenzo the Magnificent, from 1460 to about 1490, times in which there was intense experimentation as well as sharing among the students of the workshop and between painting and sculpture. 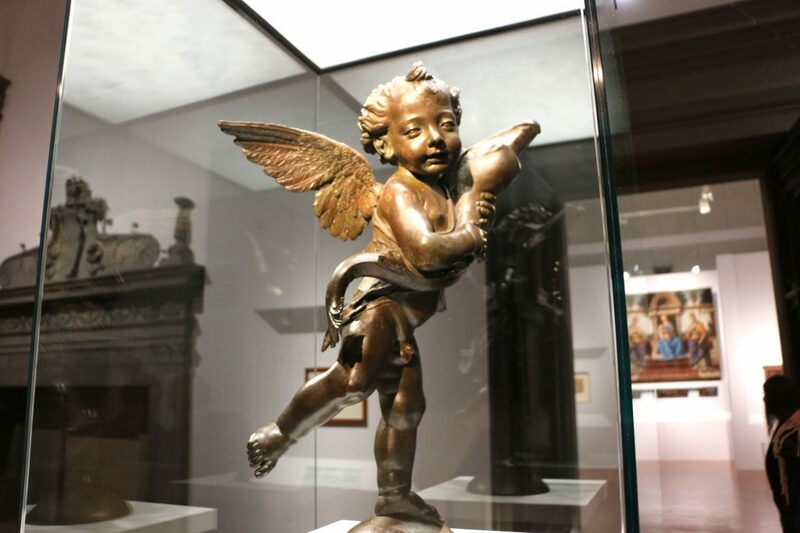 Cherub with Dolphin, also called Winged Boy with Dolphin, 1470-5, bronze, from Palazzo Vecchio in Florence. In the history of art, only Giotto, Donatello and Raphael have given origin to a “school of art” comparable to that of Andrea del Verrocchio. Through his teachings, many artists both in Italy and abroad were “formed” and inspired. 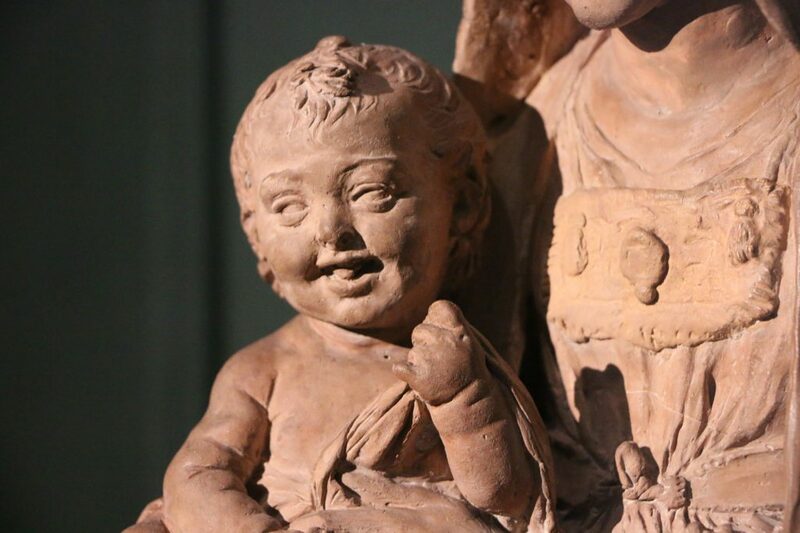 You will be able to see this through works such as the “David”, on loan from the Bargello Museum, and the “Cherub with Dolphin” restored for the exhibit and on load from Palazzo Vecchio (above is the Palazzo Vecchio courtyard is a copy). You can also see it through paintings, such as the Madonna with Child, on loan from the Gemäldegalerie in Berlin (one in the top photo) or the Madonna with Child and Angels from the National Gallery of London. 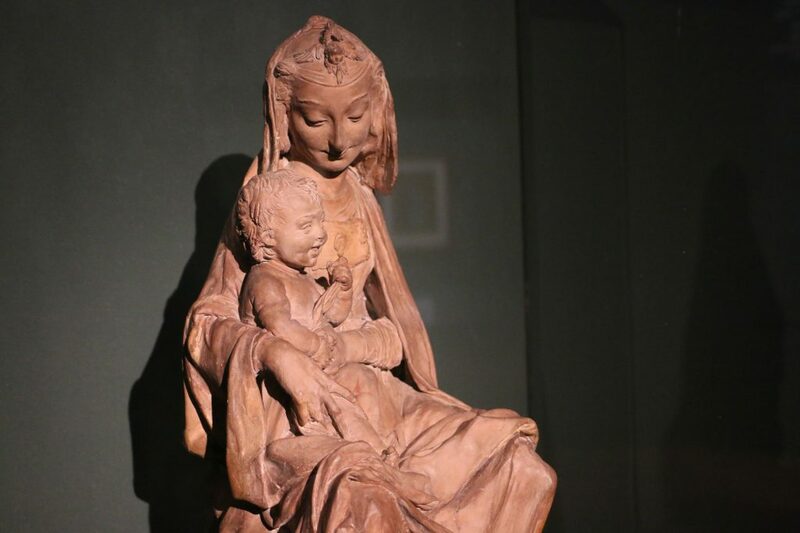 These works are together for the very first time so that we are able to see the extraordinary talent that Verrocchio mastered in the field of painting, which later became the source of reference for his famous students. Several Madonnas of Verrocchio’s students and followers, from Botticelli to de Simone. Between paintings and sculpture. Verrocchio opened his workshop on via de’ Macci in the late 1460s. Rivaled only by the equally famous workshop of the Pollaiolo brothers, Verrocchio’s practice far surpassed it for paintings, and also influenced several artists in central Italy. This is one of the many aspects that will be highlighted by the exhibition. 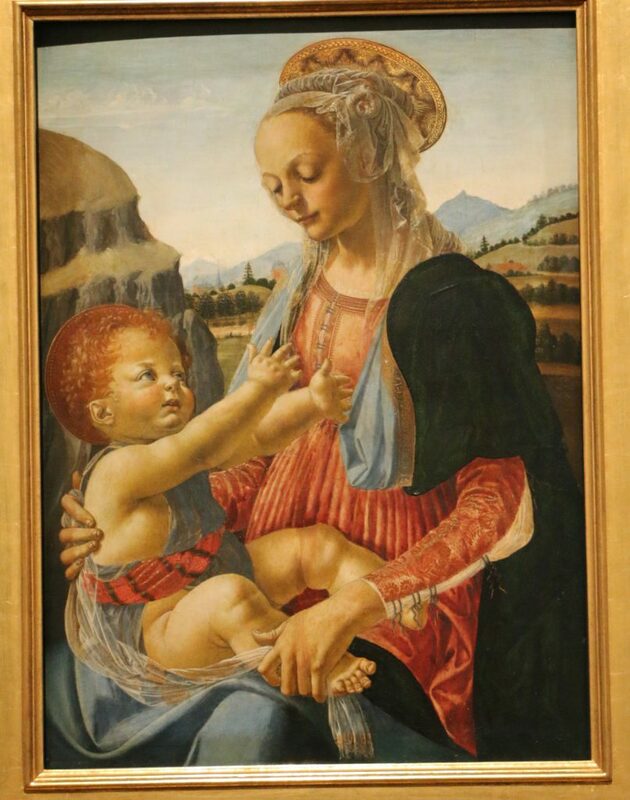 One of my favorite artists from the Renaissance is Domenico del Ghirlandaio, look at these two gorgeous Madonna with Child! Make sure to not skip over the last room at the exhibition, which includes drawings by Leonardo da Vinci and this spectacular Virgin with Laughing Child. made in terracotta and on loan from the Victoria and Albert Museum in London where it has actually been attributed to Antonio Rossellino. It has nothing directly in common with any other Florentine Renaissance sculpture, yet is has much in common with Leonard’s drawings and paintings, in particular with his early work when he learnt how to model clay extremely well while in Verrocchio’s workshop. Virgin with Laughing Child, Leonardo da Vinci. 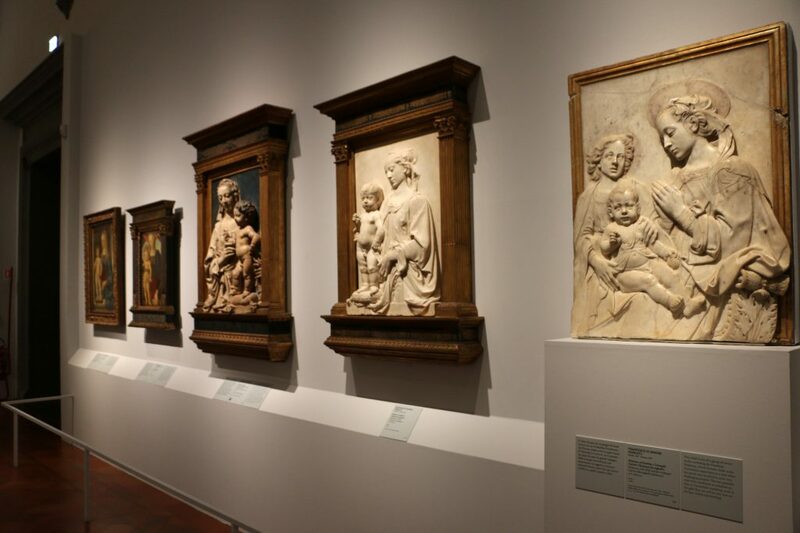 The exhibition is organized and promoted by the Fondazione Palazzo Strozzi as well as by the National Museum of the Bargello – where another part of the exhibition is being set up – and by the National Gallery of Art in Washington, DC, where the exhibition will be transferred to during the second half of 2019, from September 29 through February 2, 2020. 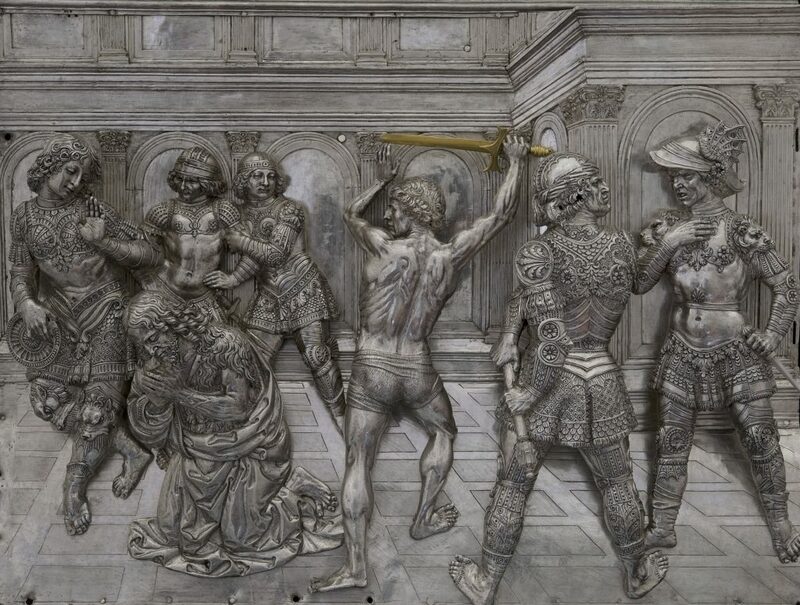 The Opera del Duomo Museum in Florence also hosts an important work by Andrea del Verrocchio: the formella of the “Decapitation of St. John the Baptist” created in silver for the Baptistery altar between 1477 and 1480 and recently restored (pictured above). It is believed that Leonardo, a student in Verrocchio’s workshop at the time, might have worked on this masterpiece as well. 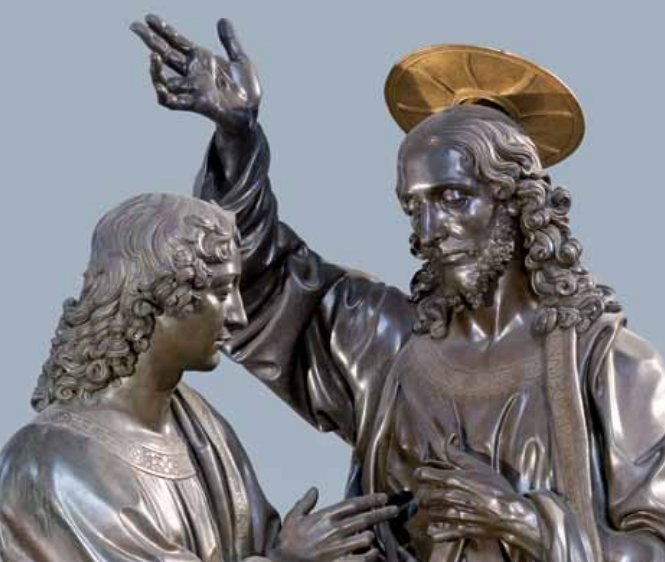 At the Bargello Museum, visitors will find the Incredulity of St. Thomas, Verrocchio’s bronze masterpiece, which comes from the Church of Orsanmichele. During the exhibition, the Bargello will be extending its hours and offering a discount to those who show their Palazzo Strozzi ticket to the exhibition: from Sunday through Thursday, open 8.15am-5pm and Friday and Saturday until 7pm. Full ticket cost will be €9, and discounted to €6 to those who show their Palazzo Strozzi ticket. 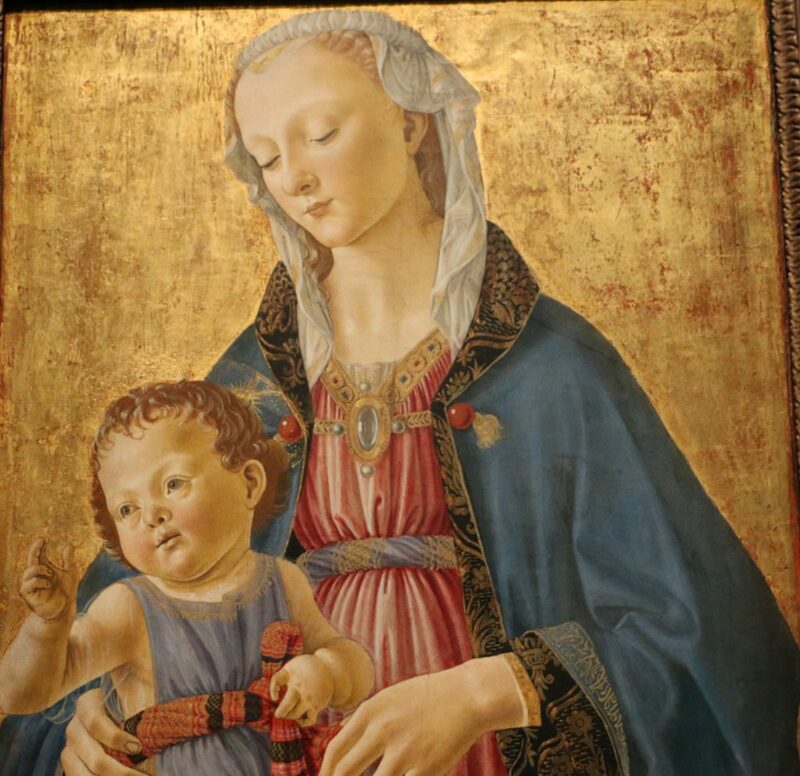 You will be able to buy a cumulative ticket to visit both the exhibition at Palazzo Strozzi and to the Baptistery and Opera del Duomo museum, which can be purchased only at the ticket offices for the Opera del Duomo (not at Palazzo Strozzi). 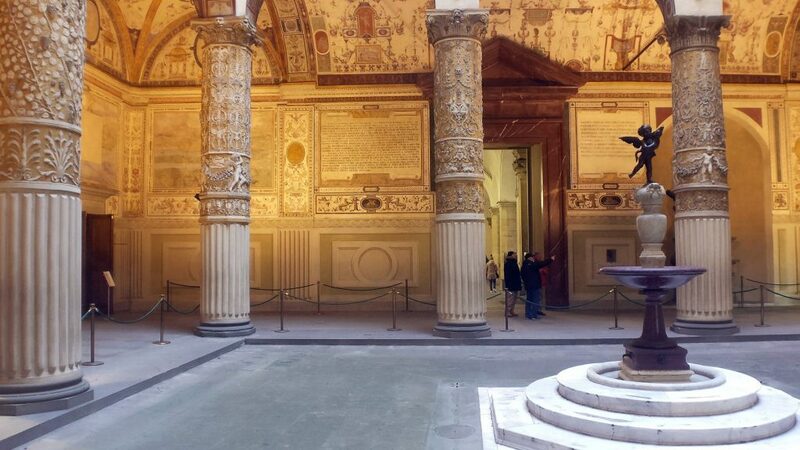 So if you wish to also visit the Opera del Duomo museum, you should start there, get your cumulative ticket, then head on to Palazzo Strozzi and to the Bargello last. 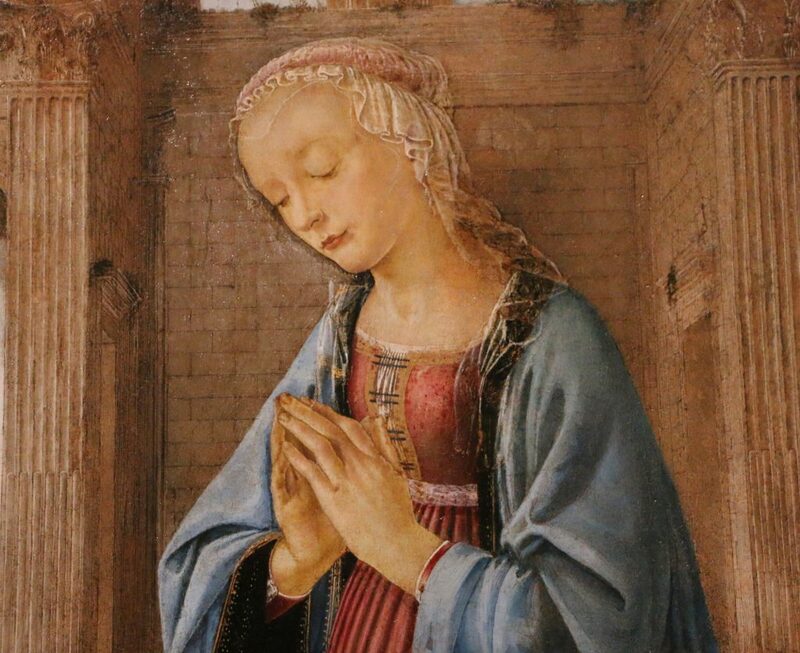 Enjoy exploring the art of the second half of the 1400s through Andrea del Verrocchio’s masterpieces and that of his contemporaries and students!